SATCOM-ON-The-MOVE While Off-Road... Fact Or Fiction?, By Dr. R. Gilmore, Managing Director and Chief Executive Officer, EM Solutions Pty Ltd.
A stroll through the exhibition hall at any of the major satellite communications conferences can seem the same, year after year. Same lights, same booths, same (bad) food, same suits. As of the beginning of July, the US has sent nearly 800 personnel to Iraq to support the government and protect its in-country presence against Islamic militants. As the army disintegrated and ISIS progressed across northern Iraq, capturing the provincial capitals of Mosul and Tikrit, the White House realized that nine years of combat in the region, and the hard fought democratic progress that came with it, could soon be undone. Looking at world history, borders and territories have been a source of dispute, inter and intra-state conflicts, crime and migration issues. Borders are internationally arbitrated demarcation lines between sovereign states, federated states and other sub-national or international entities (Schengen area, European Community etc.). Norsat provides Roger Hawkins, President of Disaster Truck, with a Norsat Newslink Terminal and accessories. Roger uses his Newslink terminal to travel the world and cover major world events. On 15 of its vehicles, Fire Department New York (FDNY) can now automatically see which firefighters are nearby via the department’s onboard computer and then relay that information to the city’s Operations Center. The system was invented by David DeRieux of the U.S. Naval Research Laboratory (NRL) Space Systems, along with Michael Manning of Manning RF and in close partnership with FDNY. Universal Test & Monitoring Platform For SATCOM — any interface, any bandwidth, any protocol —, To ensure performance and reliability, operators must have the ability to remotely monitor, maintain, and intrusively test satellite circuits and networks. Satellites get smaller, less expensive and easier to build out of what might seem to be spare parts, and companies that develop them and advance the technology are springing up as fast as capital can be found to feed them and the imaginations that are stirred to develop new uses for them. The face of modern surveillance has changed dramatically in recent years. Today’s defence officials expect a constant stream of information live from the scene as it unfolds, and they rely on a combination of video, audio, and data to provide the necessary input for making critical decisions. Event: Taking Stock Of MILSATCOM Effectiveness... MILCOM 2014, Gathering the leading minds of government, military, industry and academia. 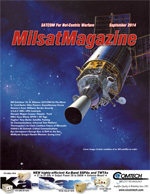 MILCOM, the premier international conference and exposition for military communications, returns to Baltimore October 6-8, 2014. Much like the race to the moon in the 1960s, history shows that the transformation of aerospace has helped the United States remain competitive around the globe. Given the sensitivities in today’s world as well as the limitations of any ongoing U.S. government support, it is imperative that the private sector continues to ensure the momentum of aerospace transformation continues to move forward. The year 2014 has, so far, seen Search and Rescue (SAR) receive global attention with several high-profile incidents in the air, on land and at sea. These include the Malaysia Airlines disappearance, the South Korea Ferry accident, a dramatic man-overboard emergency in the Clipper Around the World Yacht Race, four lost British sailors on the Cheeki Rafiki yacht and, more recently, six missing climbers on Washington’s iconic Mt. Rainier. This list, however, represents a mere faction of the SAR incidents that occur daily around the world.